There is a quality to the Little Karoo that goes beyond silence and into stillness. It speaks to the soul, and instills a sense of deep peace. It is magnificent nature, up close and personal. Once experienced, it is unforgettable! For those who wish to recharge their batteries; from a walk in the mountains; or simply sitting, ‘lost’ in the landscape - it is immensely refreshing. But for those who have a bit more time, the farm has so much more to offer. A number of different biomes converge on the farm – Fynbos, Renosterveld, Succulent Karroo and Karroo Thicket are all represented here, creating a unique diversity of plants, some of which are found nowhere else in the world. There are more indigenous plant species present in Fynbos than in the entire United Kingdom. Often flowering at different times of the year, and in different seasons, the vegetation creates an ever changing landscape, and a source of constant interest. Many of the plants here have medicinal qualities. The earliest inhabitants of the region were the Bushman, whose knowledge of the local plants and their uses is the stuff of legend. It is claimed that San, Son, or Sab were the original Khoi names for Pteronia onobromoides (boegoebossie, boegoekaroo, or laventelbossie) an aromatic bush once popular as a perfume. The names Sonqua, Sanqua, or Tanqua are derived from this term plus the Khoi suffix “qua” meaning “men” or “people”. Sanqua therefore literally means “the people or men who use aromatic bushes to anoint their bodies”. This was directly translated into the Dutch “bosjesman”, which became “boesman” in Afrikaans, and “bushmen” in English. The use of aromatic plants to treat the skin was probably not only for cosmetic reasons but also as an antibiotic protection. * The settlers who followed the Bushman in this region, had limited resources, and relied on folklore and the knowledge of the local plants for their well-being, and to this day in these parts, these plants are still a tried and trusted remedy for a number of ailments. They range from Sutherlandia, the cancer bush; to Wilde Als (African wormwood) for the treatment of chest complaints; to Wild Rosemary (Cape Chamomile) for the treatment of stomach complaints; and many, many more. Although these plants are not the realm of the casual traveler, they may perhaps be tempted to line their shoes with Agapanthus leaves, to soothe their feet after a long hike. Or perhaps to break off a bit of Bulbine, to ease a blister, a sting, a burn or an insect bite? Or stave off their thirst with a few Sorrel or Spekboom leaves? For the more adventurous, the root of the Bloubos, has antibacterial qualities, and makes a good substitute for a toothbrush, whereas the berries were once used as a coffee substitute. Bird life abounds in the Little Karroo. Prepare to be enraptured by the visiting Spotted Eagle Owls in the Bluegums at night; the resident Black Eagles circling the kloofs and mountainsides; and the occasional haunting cry of a Fish Eagle breaking the silence. Many of the birds are easy to spot, such as the iridescent sun birds sucking the nectar from the aloe flowers and wild dagga; the swallows playing over the farm dam; the Hoopoe’s in the road; or the Bulbuls splashing about in the birdbaths. 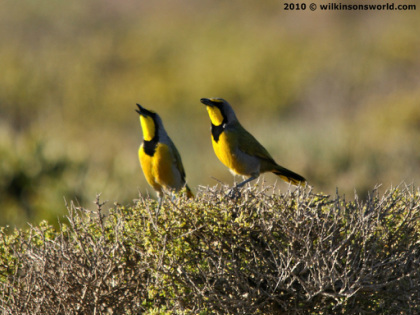 You may even chance upon the duet repertoire of a pair of Bokmakieries. Other species are more difficult to see, but their distinctive calls identify them none the less – Klaas’s Cuckoo’s plaintiff ‘mei-tjie’; the tapping of a Cardinal Woodpecker; or the Fiery-Necked Nightjar, greeting the onset of darkness with the unmistakable “Good Lord Deliver Us”. Mike Hewitt, former Chairman of the Rooiberg South Conservancy, and keen conservationist and birder, has drawn up a list of 120 species of birds spotted here. There are many fossils here too, for those wishing to pick at the bones of our Mother Earth. The Karoo is an ancient landscape, dating back to around 270 million years. It was once a vast sea, and home to Dinosaurs. Embedded in the Shale, the fine grained clastic sedimentary rock that was once the sea bed, are dozens of fossils. The Shale lies close to the surface here, and there are piles lining the road, or in disturbed areas where a pipe has been laid, or a hole dug. 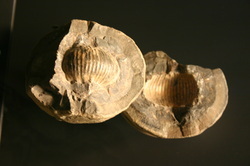 These are treasure troves for the curious, and careful splitting of the layers can reveal ancient shells, invertebrates or even the prized trilobites that date and track the evolution of the area.